COMMERCIAL DUCT CLEANING: DO YOU HAVE VAV BOXES IN YOUR DUCT WORK? Home/Commercial Duct Cleaning Articles, Frequently Asked Questions/COMMERCIAL DUCT CLEANING: DO YOU HAVE VAV BOXES IN YOUR DUCT WORK? 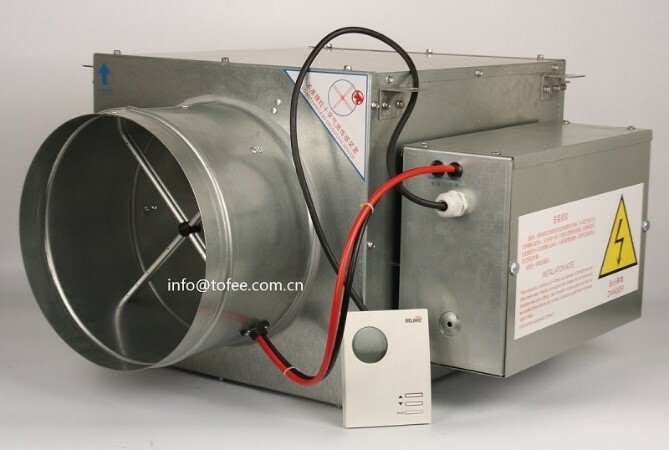 VAV (Variable Air Volume) is a type of heating or air conditioning (or both) system typically installed in commercial and industrial buildings. A VAV allows a way to zone heat and air from one large HVAC system to specific areas in a large space such as separate offices in a large office building. What is a VAV box? A VAV box is essentially a sheet metal box with a damper and a control panel. A thermostat is connected to the control panel which alters the internal damper. This damper controls the air flow and temperature. The box is usually on the inside of the supply duct work but can also be attached to the outside of the duct work. Some VAV boxes may have an internal heating source inside the box. The heat source is usually electric but can be a hot water coil (called re-heat coils). The temperature is controlled by the thermostat. Usually setting the thermostats is the responsibility of the maintenance crew so the HVAC system itself isn’t overloaded. 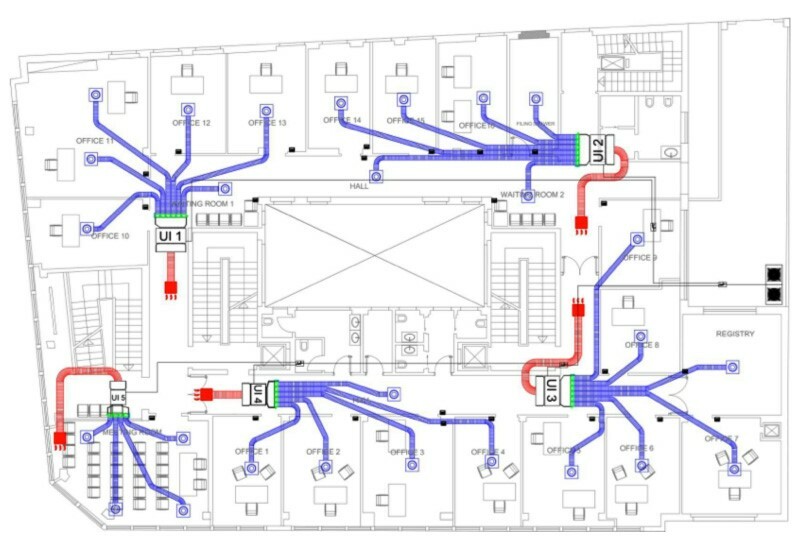 As you can see by the drawing below, 5 systems service this entire building. The HVAC unit supplies the air through a main trunk line and lines feeding off that main trunk have VAV boxes. The VAV boxes supply the separate areas with heat and air conditioning. This allows one large unit to supply an area instead of having several individual units. Every office in this picture can maintain it’s own comfortable setting for heat and cool air. You can expect VAV boxes to work at peak performance if you clean regularly. They should be cleaned every three to four years along with the entire HVAC system. It is best to leave the cleaning to professionals like Advanced Furnace & Air Duct Cleaning. VAV Boxes have many components that need to be cleaned individually. Only experienced duct cleaners have the skills and proper equipment to carry out this task. Be very careful as an untrained tech or company can cause expensive damage to the boxes. When contaminants and debris collects in the VAV Box, it is not able to properly function. This can cause higher energy costs, lead to costly repairs or even decrease the units longevity. The contaminants can also pollute the indoor air quality in the building. Advanced Furnace & Air Duct Cleaning, Inc. understands how important it is to keep your heating and cooling system working at peak performance. Our NADCA trained techs will deliver a complete cleaning of both the VAV boxes, the ductwork and all components of your HVAC system. Remember, only a professional and experienced company should be hired to clean your system. Give Advanced Furnace & Air Duct Cleaning a call today to set up a free estimate. Call us at 800-317-7104.